The Lower Crab Creek dam/reservoir proposal would be expensive and would destroy prime fish, wildlife and recreational lands. The U.S. Bureau of Reclamation has also proposed Lower Crab Creek for a new dam and reservoir in order to expand the Columbia Basin Project eastwards into the Odessa Subarea. If the project is approved, it is not clear how the waters of the new Crab Creek reservoir would be divided between eastern and southern irrigators on the Columbia Plateau. In addition, the Bureau has expressed interest in creating a barrier to salmon passage into Lower Crab Creek in order to eliminate the impact of endangered fish on irrigation. 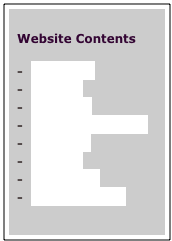 See Crab Creek Subbasin Plan (NWPCC 2004). In other words, the Bureau wants to remove all migrating salmonids from the Columbia Plateau, no doubt to minimize its obligations under the Endangered Species Act. Finally, the Bureau has identified Upper Crab Creek as a new route to convey yet more water from Banks Lake to irrigators in the southern portion of the basin. For the Bureau, Crab Creek is nothing more than a canal system. Environmental and cultural values are meaningless to the agency. 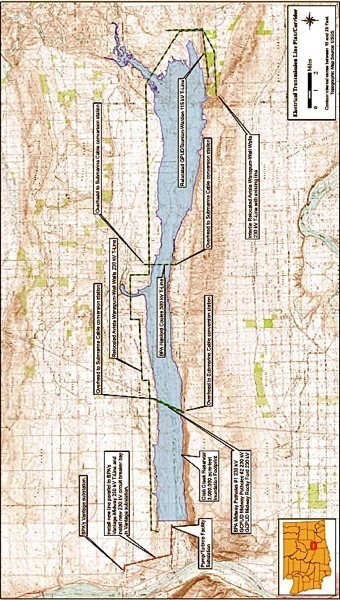 The proposed Crab Creek Dam would consist of a concrete-face rockfill structure nearly two miles long (i.e., twice the length of Grand Coulee Dam) and up to 240 feet in height. The reservoir would be filled by pumping “surplus” water from the Columbia River and then releasing it back into the River to allow downstream farms to pump it back out again. Water would also be released from Crab Creek Dam to “augment” flows in the Columbia River for migrating salmon. The appraisal report for the dam evaluates three sizes of dam and reservoir, holding 1, 2 and 3 million acre-feet (MAF) of water. Construction costs for the dam-reservoir project would range from around $1 to 2.3 Billion, depending on size. Pumping costs would net from $1.5 to 7 Million each year. Annual operating costs would range from $3 to 9 Million. None of the reports discuss who would pay these costs. The Lower Crab Creek is farmed on the east end. The new reservoir would flood up to 8,600 acres of currently irrigated farmland. On the west end, Lower Crab Creek consists of 19,000 acres of wetlands, streams, lakes, and terrestrial shrub steppe designated as federal and state wildlife habitat. The prime use of this area by humans is to fish, hunt, and watch birds. This wildlife system includes a chain of lakes -- Nunnally, Lenice and Merry – that support fish and bird populations. In addition, a trail system exists in the Lower Crab Creek area, and Washington is contemplating expanding the trail system. 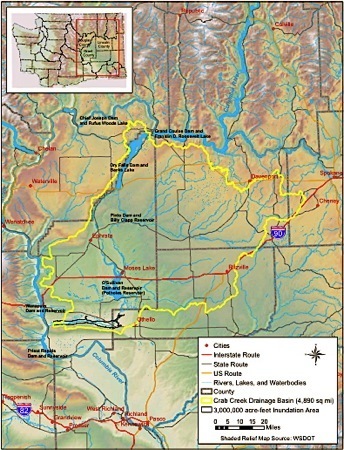 In 2006, the State Legislature enacted Senate Bill 6527, designating the abandoned Milwaukee rail line (which runs through Crab Creek) as a recreational area, and also allows the state to “establish and maintain a rail line over portions of the Milwaukee Road corridor owned by the state between Ellensburg and Lind” by entering into an agreement with a rail carrier. Crab Creek, central Washington state.